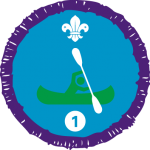 The Time on the Water Staged Activity Badge is earned by taking part in water-based activities within Scouting. For Explorer Scouts, the activities and sessions should last 2-3 hours to be counted towards this badge. The Time on the Water Staged Activity Badge is earned after completing 1, 2, 5, 10, 15, 20, 35, and 50 instances of water-based activities. For all sections, you must be dressed and equipped appropriately for the terrain and weather conditions. The leader in charge will ensure that you are properly following the rules of the Scout Association Policy Organisational Rules (POR) Chapter Nine. Copyright © Basingstoke East Phoenix Explorer Scouts 2019. All rights reserved. Charity number: 1046979 (England and Wales).